KUALA LUMPUR: VX nerve agent, a chemical on the United Nations list of weapons of mass destruction, was used to kill the estranged half-brother of North Korean leader Kim Jong Un in last week's bizarre murder in a busy Kuala Lumpur airport, Malaysian police said yesterday. Mr Kim Jong Nam died on Feb 13 after being assaulted by two women who wiped the toxic chemical on his face as he prepared to board a flight to Macau at the Kuala Lumpur International Airport (KLIA). Malaysian police are investigating if the illegal VX, believed to be the most toxic known nerve agent, was brought into the country or made there. Authorities are sweeping the airport and other locations for radioactive material. "If the amount of the chemical brought in was small, it would be difficult for us to detect," Malaysian police chief Khalid Abu Bakar told reporters. Police had arrested the two women - one Vietnamese and the other Indonesian - and a North Korean man last week. They are also seeking seven other North Koreans wanted in connection with the case, including a diplomat at the embassy in Kuala Lumpur. North Korea is believed to have the world's third largest stockpile of chemical weapons, according to the Nuclear Threat Initiative project, which analyses weapons of mass destruction, reported Reuters. 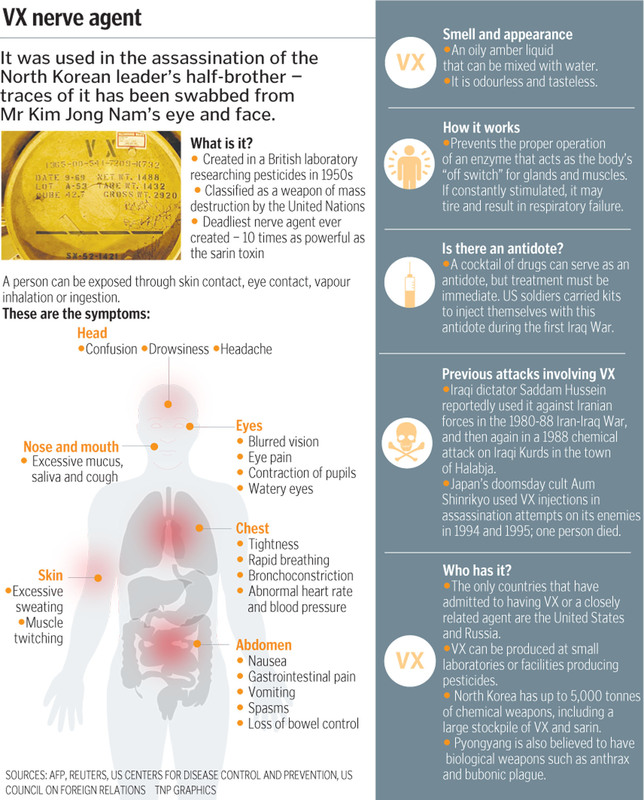 South Korean analysts have identified sarin and VX as the focus of the North Korean chemical weapons programme. Police said swabs taken from the eye and the face of Mr Kim Jong Nam revealed the presence of VX nerve agent, S-2 Diisoprophylaminoethyl methylphosphonothiolate being its chemical name. "Other exhibits are under analysis," Mr Khalid said in a statement, which cited findings from a preliminary report from the government's chemical weapons analysis unit. VX is tasteless and odourless, and it is outlawed under the Chemical Weapons Convention, except for "research, medical or pharmaceutical purposes". It can be manufactured as a liquid, cream or aerosol. Experts said VX has no commercial uses. "This is not something you make in a kitchen lab. This is something that is made in a very sophisticated chemicals weapons lab," said Mr Bruce Bennet, a senior defence researcher at the California-based Rand Corporation. VX in liquid form can be absorbed into the body through skin or eye contact and does not evaporate easily, so it can persist in the environment. After giddiness and nausea, exposure to VX quickly progresses to convulsions and respiratory failure before death, according to the US Centers for Disease Control and Prevention. Absorbed in large doses, it is fatal after 15 minutes, according to the US Army's Edgewood Chemical Biological Center, making it the world's most toxic known nerve agent. Police also said they will ask the Atomic Energy Licensing Board to carry out a sweep of the KLIA 2 for traces of the highly toxic VX nerve agent. Mr Khalid said there could still be traces of the chemical at the scene following the incident. "Yes, we are worried about that, but I am not the expert so we will get the experts to come and check," he said at KLIA yesterday. Mr Khalid said, however, that there "is no need to stay away" from KLIA2 or to cordon off the area just yet. Mr Khalid confirmed that one of the women suspects was suffering from side effects of the chemical.